urbanest Vauxhall’s student accommodation offers much more than great transport links however, being situated in the heart of one of central London’s most vibrant and fast developing social and cultural hubs. For art lovers, Tate Britain is a short walk across Vauxhall Bridge and Newport Street Gallery, Damian Hirst’s incredible new project housed within a renovated Victorian scenery-painting studio, is also just a short walk away. 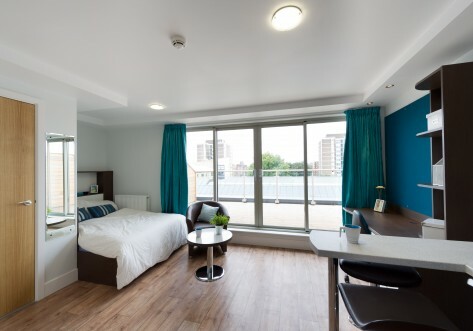 Accommodation at urbanest Vauxhall is split between a range of modern, high specification studio apartments and also apartments that offer a sociable yet secure student life with either en-suite or private rooms to suit your budget. urbanest Vauxhall is situated at the centre of Vauxhall Nine Elms – central London’s newest, most exciting riverside quarter on the south bank of the River Thames. Already one of the most vibrant areas of zone 1, Vauxhall is set to become an even more dynamic, social and cultural hub with the arrival of the new American Embassy, the completion of the iconic Battersea Power Station and its numerous parks and riverside walks. Just a few minutes’ walk from the front door of Urbanest Vauxhall is Vauxhall mainline railway station, the Victoria Line tube station and Vauxhall Cross bus station. This puts all of London’s major Universities and Colleges within easy reach, with King’s College London, LSE and London South Bank University in particular just a short bus ride away. One of London’s new cycle superhighways also runs right past the building, giving easy access to the West End for anyone who prefers to get around on two wheels. deal for an individual or sharing with friends. A private, lockable rooms in a four bedroom flat. 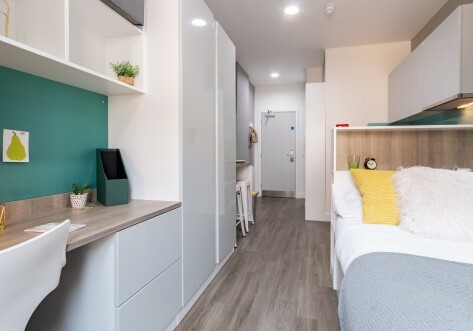 Each flat comes with underfloor heating as well as a luxury shower room along with comfortable memory foam mattress, built-in desk and desk chair, lots of storage space plus a personal kitchen area with sink. 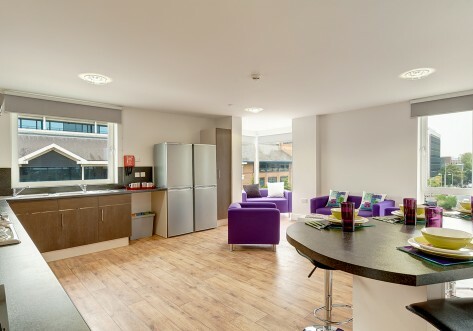 Private rooms also have access to a large, shared, sociable kitchen with modern appliances such as ceramic hob, dishwasher, fridge/freezer and microwave. Complete with your own private lockable bedroom and luxury en-suite shower room – finished to the highest of standards. Each of these rooms in this apartment share a communal kitchen and lounge. The kitchen has an oven, ceramic hob, microwave, fridge/freezer, lots of cupboard space and dining area. Our en-suite rooms are perfect for anyone sharing with friends or looking to making new ones. Our studio room is an entirely self contained flat, suitable for single occupancy or for a couple. urbanest studios always have the highest quality finishes and modern kitchens. Studio rooms also contain a luxury en-suite toilet and shower room. Our large studios offer stunning views across the city featuring a built in desk, desk chair, underfloor heating, bed, luxury shower room, kitchen and lounge area. 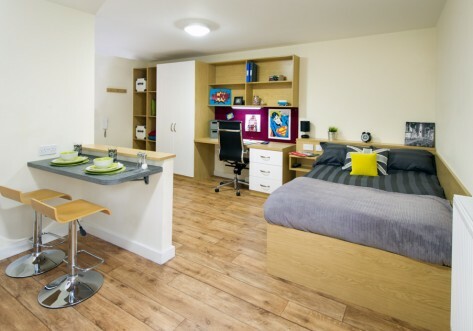 Semester 2 and Short Term Tenancies Available. Contact us for details!